Manila (AFP) – Giraffes and zebras were badly injured and left with almost no food when a deadly typhoon struck a Philippine island reserve for African wildlife, an international animal welfare group said Wednesday. Super Typhoon Haiyan felled many trees at the ‘ reserve when it raked across the central islands nearly five weeks ago, injuring some of its animals, said Birgit Leber of Vienna-based Four Paws International. 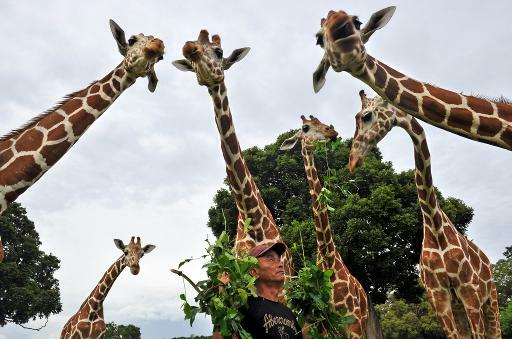 “Eight or nine giraffes out of 21 need medical treatment,” Leber, a member of a Four Paws team who had gone on a relief mission to Calauit earlier this month told AFP by telephone. “Two or three zebras have not been eating very well, and one was seen walking strangely,” she said. The isolated 3,760-hectare (9,287-acre) island on the South China Sea was turned into a a wildlife reserve by the late Philippine dictator Ferdinand Marcos in 1976. The current government has continued to promote the island to tourists as offering a glimpse of Africa in a remarkable tropical setting. Two of the reserve’s giraffes had open wounds above their front legs that were probably caused by falling trees, said Leber, an assistant to Four Paws’ director of project development. Four Paws learnt the injured animals had not gotten any medical attention at all, and it plans to send a second mission to Calauit in the next few days to treat them, Leber told AFP by telephone. “The (Calauit) animal hospital, sad to say, is broken and there is no medical equipment to treat the animals,” said Leber. The first Four Paws team did not see the other animals, but observed that much of the food source of the giraffes had been destroyed. “Most of the trees fell down. Giraffes eat from trees, they do not eat from the ground, so there is nothing left for them to eat,” Leber said. Four Paws brought six tonnes of emergency food rations to the island, good for three months, so its giraffes would not starve, she added. The reserve’s director, Froilan Sariego, could not be reached by telephone by AFP on Wednesday. Calauit was originally stocked with 104 heads of giraffe, zebra, impala, waterbuck, gazelle, eland, topi and bushbuck acquired from Kenya, along with native wild mammals, according to its official website. When AFP visited the reserve, located about 300 kilometres (180 miles) southwest of Manila, two years ago, it had just over 100 African animals, about the same as the original stock.